I never need an excuse to buy a book as I love reading and my books are my most treasured possessions, so when I heard that Jonathan was going to be writing a book on ‘Apostolic Theology’ I began to wait with great anticipation, the wait being longer than originally expected, but when the book arrived it certainly was worth waiting for, all 744 pages. It is a book that is based upon a Trinitarian, Evangelical and Pentecostal understanding of Christian doctrine. It is a well-produced book, with good design making an attractive cover, but it is the content I am more interested in. The internal layout of the book is also well done and the author has presented his subject matter in the order of the Tenets (doctrinal statement) of The Apostolic Church UK, the Church in which he himself is an ordained minister and likewise myself; we have been colleagues and friends for a few years. As I have read through the book it becomes very clear that Jonathan knows what he is talking about and that he also knows on a very personal level the one to which doctrine is meant to lead us to, The LORD God himself through the person of the Lord Jesus Christ. 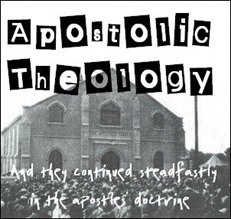 Throughout the book, he handles the subject matter by referring not only to the 100 years of history of the Apostolic Church UK with quotations from the teaching, preaching and written material of many of the previous pastors within the movement, but also by many quotations from so many other significant theologians throughout the 2000 years of history of the Church which Jesus is building, and of course from the Book itself, the Scriptures which must be the source for all our theology. From this it is obvious that Jonathan has spent many long hours in reading and researching – and the book is very clear evidence that it has paid off. For me the book has not only been interesting, inspiring and educational to read but also enlightening in that there have been what might be called smaller details of which I personally had never fully considered as much as I probably should have done. Some of the Chapters cover subject matter much more than others i.e. if I had been writing the book I probably would have written a lot more on the subject of the gifts of the Holy Spirit (seeing as the movement is a Pentecostal movement) than on the subject of communion whereas Jonathan has managed to do it the other way around! (34 pages and 52 pages) This isn’t a criticism it is to simply show how he has managed to go into great depths in areas that perhaps wouldn’t generally be covered as well. I have initially read the book through as I would generally read any other book, but I will spend more time in it using it as a resource and to go into the subject matter much deeper. For anyone who is involved in Christian ministry it is a book that I would wholeheartedly recommend and for anyone who is involved in the leadership of the Apostolic Church in any capacity I would recommend it as a resource to enable the reader to become better acquainted with the things that we most surely believe as a fellowship. 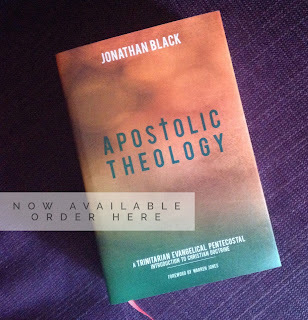 The Apostolic Theology Book is Finally Here!